This New Brunswick alphabet book includes short poems for each letter, accompanied by detailed paintings and explanatory text. 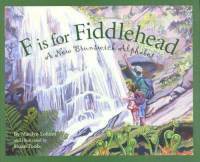 Reviews: Gowans, M. “Review: F is for Fiddlehead: A New Brunswick Alphabet.” Resource Links 13. 2 (2007): 6. Web.